1. Pick a partner with experience with your application. how low is the lighting (i.e. how strong of backlighting do you need/want)? How will the switch be mounted or attached to your product? Based upon those requirements you may choose between a copper vs. silver printed circuit, an embossed button vs. a silicone keypad or individual LEDs vs. a light guide film that evenly lights and an entire section of your switch. 2. Think about how you will install the switch onto your product. It’s easy to provide a switch with pressure-sensitive adhesive on the back of your switch, but is your vendor using the right adhesive? Depending upon the application surface, you may require a high-service energy (HSE) or low-surface energy (LSE) adhesive. High energy surfaces include metals, some plastics, epoxy, polycarbonate, fiberglass and acrylic materials: these items accept almost any type of PSA. Low energy surfaces include plastics such as polystyrene, polyethylene, polypropylene and some coatings like Teflon®: these items exhibit weaker attraction and require specialized LSE adhesives. 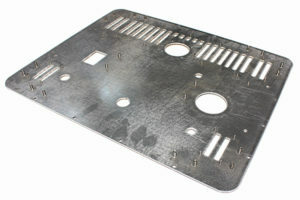 Perhaps you need the structural rigidity of a metal back panel with studs for easy mounting. Make sure your partner has in-house metal fabrication capabilities so the design mates seamlessly with your part and there are no delays or markups from outsourcing. 3. Pick an ISO certified partner with US-based design staff. A membrane switch is a surprisingly complex part. 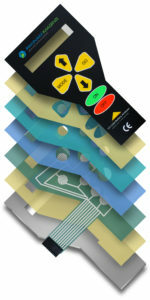 Each layer (back-panel, printed circuit, spacers and overlay) must register and mate precisely to the adjacent layers. Specified materials, adhesives, colors and mounting method must be designed to survive in your application. Pick an ISO certified supplier who’s design staff can work with you (in your local time zone and language) to ensure all requirements are understood and met. 4. Pick a responsive partner—not just for quotes, but also design/manufacturing changes. Good customer service and design should be the norm, but it isn’t. A secret shopping exercise uncovered a wide range of response times to quotes and change orders from minutes to days. If you feel your current supplier is slow to react, try a new vendor. However, watch out for unexpected costs like Non-Reoccurring Expenses (NREs) or high-unit costs at low volumes. 5. 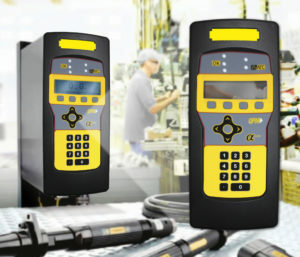 What about other product identification like nameplates, barcode labels or safety placards? Think about all your identification needs and pick a partner who can also provide your product’s nameplates, barcode labels and safety placards. Bundling your switch job with other printed products may lower piece price and reduce paperwork by working with a single vendor.